When working an image on a piece of lava rock there are a lot of limitations imposed on the artist. so it is reasonable to deduce that the artist is capable of a more realistic representation using other mediums. If this artist was using paint, such details as the Bighorn sheep's eye and proper realistic coloring of the animal would be there. This is one of the most famous petroglyphs in North America and rightfully so. It is unique in many ways. To start with, it’s an action shot with two characters inter-acting with each other. 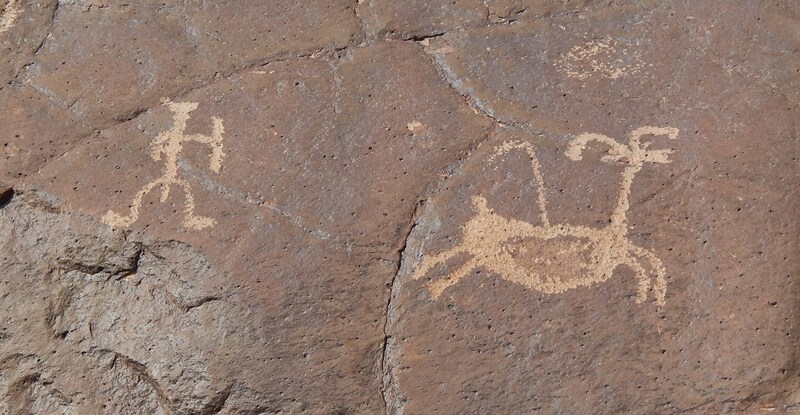 This alone puts it in a rare and unique category of petroglyphs, and makes it worth trying to understand all that we can read from it. We can start by cataloging all the various artistic attributes that we see in this picture then try to understand them in their totality. We start with looking at the hunter. One of the first things we notice is that the artist chose to emphasize that this hunter is a man. This probably has more to do with a macho attitude rather than any necessity in communicating this, as traditionally women do not hunt big-game in hunter- gatherer societies. Next we see that this hunter is wearing a hat. This may indicate that it was cold when this event happened or might be related to the status or position that this hunter had within the tribe. Then of course sometimes a hat is just a hat. Now let’s take a look at his bow. There is a lot of information here. To start with the way it’s drawn may indicate that this hunter is right-handed. The fact that we have a bow being used on a Bighorn sheep is significant in itself. It tells us that, at the time this glyph was made, the bow was sufficiently developed to be used for Bighorn sheep as opposed to the Atlatl. Then we can relate this information to the level of patina on this glyph and we can see that it’s relatively old. That is to say, the patina has started to grow back over it. This tends to bracket the age of the glyph to a time when archery was relatively new. Furthermore we can see that this bow is not a "recurved bow" and is relatively thick, indicating perhaps some of the possible attributes of the first bow used for big-game. Now let’s take an inventory of the desert Bighorn sheep. To start with the horns on this animal are big enough that it is most likely a young ram. However, their size and shape can also be interpreted as those of an older ewe. How one sees or interprets the horns on this animal will influence the interpretation of what one sees in our next major component of this glyph. The body of this sheep was centered on an older glyph that has no recognizable symbolism of itself. Then the artist was careful to leave a partial outline of the original patina between the old and new glyph. This gives this Bighorn sheep glyph three separate times that are represented within one glyph. Perhaps this is representing the fact that this sheep is part of ongoing succession of its species. Or perhaps more to the point this could be a representation of a pregnant sheep. We have other glyphs that show this very clearly in the Coso mountains. Now let’s turn our attention to the arrow that is striking the sheep in the middle of its back. Here the artist has provided us with some incredible detail. The fact that the arrow is bent and fades out back toward the hunter is significant. The direction that it is bent indicates that it came from our hunter and had a arched trajectory. Then the artist was able to portray the last fraction of a second of flight before impact when the arrow was visually a blur. Next, it seems like the artist tried to portray this animal with its mouth wide open at the moment it was hit, giving us the impression that this animal is screaming in pain. This gives us another indication that this petroglyph is a precise moment in time. However, it’s been my experience that desert Bighorn sheep do not vocalize when mortally wounded as do other animals, such as the coyote does. Therefore, this detail may be an indication that the sheep has been running at full speed and breathing heavily rather than denoting the moment of the kill. And finally we should contemplate the mysterious and nebulous cloud above the sheep's head. By examining it closely we find that the patina is in the same condition as the sheep and the hunter, and so it was made at or near the same time as they were. This would seem to indicate that it is part of this overall scene and its message. Given the tremendous detail in which our sheep and hunter are shown, this third component, if part of this scene, is very different. It is abstract and mysterious. Perhaps it is trying to express something that is abstract or supernatural, that is impossible to draw realistically. Here we enter into speculation rather than just describing the anatomy of a drawing. There are many possibilities one can think of. We can explore two to exercise our imagination. One possibility is that both the sheep and the hunter were following a cloudburst that led to this moment . I myself have experienced desert Bighorn sheep leaving an area and walking 5 or 10 miles to Where a thunderstorm has hit. Then on a more spiritual plane this cloud might indicate the individual spirit of the sheep at the moment of the kill, going back to the supernatural world, back to the collective spirit of its species. This is a common belief system among many Native American tribes and hunter gatherers throughout the world. So we’re left with the question. Is this a artistic and beautiful rendition of a hunting scene in the physical world, or is this symbolically showing us something that they considered part of the eternal and mysterious way of things. You must guard your intellect or you'll experience the phenomena of garbage in garbage out. Carlos Gallinger and Tim Liddell discuss desert survival tips including the ten essential items you should bring on any hike.